Visual function assessment is integral to the evaluation and management of glaucoma. 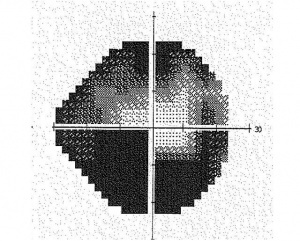 Visual field testing can be performed by various methods, including confrontation technique, amsler grid, tangent screen, kinetic perimetry, or static perimetry. This review will focus primarily on standard automated perimetry (SAP). Advances in computer technology have facilitated more sensitive and reproducible visual field loss detection than was possible with manual perimetry, allowing clinicians to detect glaucoma earlier in its course and to monitor loss quantitatively over time. The normal eye can detect stimuli over a 120º range vertically and a nearly 160 degree range horizontally. From the point of fixation, stimuli can typically be detected 60º superiorly, 70º inferiorly, 60º nasally, and 100 degrees temporally, though the true extent of the visual field depends on several features of the stimulus (size, brightness, motion) as well as the background conditions. The field of vision is often depicted as a three dimensional hill, with the peak sensitivity to stimuli occurring at the point of fixation under photopic conditions, decreasing rapidly in the 10º around fixation, and then decreasing very gradually for locations further in the periphery. Nerve fibers pass through the sclera at the optic nerve head, typically 10-15º nasal to fixation. At this location, no photoreceptors are present, creating a normal absolute scotoma. Detection of visual stimuli relies on an intact neural pathway beginning with retinal photoreceptors, and then proceeding through bipolar cells, retinal ganglion cells (RGC), and brain neurons extending from the lateral geniculate to the occipital cortex. Visual field loss in glaucoma is the result of damage to the RGCs. Bipolar cells synapse with several different types of RGCs, and it is believed that each type of RGC completely covers the field of vision. Some RGC types may be more damaged in glaucoma than other types, leading to the idea that visual stimuli preferentially detected by RGC types which are most likely to be damaged in glaucoma would be able to detect glaucoma at its earliest stages. The three types of ganglion cells are parvocellular, magnocellular, and koniocellular. Of these, the parvocellular or p cells are the most abundant and transmit information about color and form. The magnocellular cells transmit information about flicker and motion. The koniocellular cells are involved with transmission of short or blue wavelength. This redundancy in ganglion cells is responsible for non-selective nature of standard automated perimetry (SAP), and histological studies have shown that a significant number of ganglion cells may be lost before visual field deficits are manifested on SAP. This rationale has led to development of new perimetric tests such as short-wavelength automated perimetry (SWAP) and frequency doubling technology (FDT), which may be able to enhance earlier detection of functional loss by targeting a specific subset of ganglion cells that have sparse distribution. Both SWAP and FDT are described in more details later. Nasal fiber supporting the retina nasal to the optic nerve head. The maculopapillary bundle proceeding directly from the macula to the temporal optic nerve head. The arcuate fibers. These fibers are names for the arcuate course they take from the peripheral macula and the temporal retina outside the macula to the superior and inferior optic nerve head. The most common types of visual field deficits in glaucoma result from damage to the nerve fibers in a given location and distribution. As nasal fibers and the maculopapular bundle are typically spared until late in the disease process, it is common to have a central or temporal island of vision remaining in eyes with advanced glaucoma Damage to the arcuate fibers, on the other hand, is commonly seen and deficits correspond to the anatomy of these fibers. Damage is always nasal to the blind spot, and is often in the form of a “step” in the nasal aspect of the visual field. More significant damage to the arcuate fibers can result in an arcuate or Bjerrum scotoma. Occasionally, RGCs from the inferior parafoveal retina join the arcuate fibers, resulting in a superior paracentral scotoma. As the arcuate fibers do not cross the horizontal midline, most glaucomatous visual field loss respects (i.e. doesn’t cross) the horizontal midline. Finally, while glaucomatous visual field loss can occur anywhere in the visual field, most patients with visual field loss have some detectable field loss within the central 24-30º. Perimetry refers to the systematic measurement of the visual field, and is an essential component of defining the extent and progression of glaucoma, as well as numerous other eye conditions. All perimeters measure sensitivity to stimuli at multiple locations in the visual field, though multiple variables define the perimeter. Currently, standard automated perimetry or white on white perimetry is the most common form of visual field testing. Here, a white stimulus is projected on a white background to determine the threshold values. While all perimetric tests require a perimetrist to administer the test, manual perimetry requires a greater interaction between the perimetrist and the subject, most often with regards to manual presentation of the stimulus and recording of the patient’s response to the stimulus. Automated perimetry offers obvious advantages to manual perimetry in that stimulus presentation as well as the recording of patient responses can be standardized, leading to more reproducible results. Manual perimetry is still useful for individuals who cannot adapt well to the automated interface. Additionally, manual perimetry is not confined to the visual field testing algorithms defined by automated perimeters, and remains useful for testing in certain situations. Stimuli presented by perimeters can be static or kinetic. In kinetic perimetry, a stimulus is moved from a non-seeing (subthreshold) area to a seeing (suprathreshold) area, and the location where the object is first seen is recorded. The speed the stimulus is moved should be standardized, typically at 2-4 degrees per second. In static perimetry, stationary stimuli are presented at defined points in the visual field. Stimuli presented for longer durations of time may be seen better as a result of temporal summation of information, though limited additional benefit is derived beyond times over 1/10th of a second. The Humphrey and Octopus perimeters use stimuli presented for 0.2 seconds and 0.1 seconds, respectively, maximizing temporal summation while minimizing patient attempts to redirect fixation towards the stimulus. Larger targets are more likely to be detected based on spatial summation of the stimulus. Target sizes of stimuli used in modern perimeters frequently use the convention introduced with the Goldmann perimetry. Five different stimulus sizes are defined by Roman numerals I through V. Each stimulus covers a 4-fold greater area, ranging from 0.25 mm2 for a size I stimulus, to 64 mm2 for a size V stimulus. For the Humphrey perimeter, a test stimulus of 4 mm2 (corresponding to a Goldmann size III stimulus) is most commonly used, though larger stimulus sizes may be employed for individuals with poor visual acuity. The Humphrey perimeter tests light intensities over 5 orders of magnitudes, from 10,000 apostilbs (asb) to 0.1 asb. Every log order change in light intensity corresponds to 10 dB, such that the machine can measure sensitivities over a 50 dB range. Test locations unable to see a stimulus of 10,000 asb are assumed to be totally blind (though they may still see brighter lights (or other visual stimuli such as motion), and are assigned a value of 0 dB. The threshold values reported for each location reflect the extent to which light can be dimmed and still detected. For example, a value of 30 dB indicates that the stimulus can be dimmed 1000-fold to 10 asb. The state of light adaptation of the eye at the time of the visual field test influences luminance sensitivities. The Humphrey perimeter uses background lighting of 31.5 abs to saturate rod photoreceptors, producing photopic conditions in which cones are primarily tested. In this test strategy, a suprathreshold stimulus is presented at each location based on the threshold values from prior points. Intensity is decreased at fixed increments until the stimulus is no longer seen, and then increased at fixed increments until it is seen again. The threshold value is taken to be equal to the intensity of the last stimulus seen at that location. Compared with newer strategies, full threshold strategies employ smaller steps in intensity and involve more reversals in the direction of presented stimuli (i.e. ascending or descending), resulting in longer test times. This program determines threshold with a single reversal using an increment of 3 dB. Although it is faster than FT, it has been reported to underestimate the severity of visual field defects. This algorithm developed for the Humphrey perimeter uses a complex mathematical model to estimate threshold values for each point based on responses to stimuli presented at that location, as well as information gathered from nearby locations. Full threshold values are still obtained for the first 4 points tested (one in each quadrant of the visual field), and at least one reversal from descending to ascending intensity is obtained for each location. Test times in normal individuals are roughly half as long as full threshold tests, with similar or better reproducibility. Testing of the physiological blind spot. Each eye has a physiological blind spot at the optic nerve head, where the absence of photoreceptors produces an absolute scotoma roughly 10-15º temporal to the fovea. Fixation can be tested by mapping of the blind spot, and then retesting the blind spot throughout the visual field test. Positive responses during retesting of the blind spot are assumed to reflect loss of fixation. Monitoring of eye movements using an eye tracker system. Outputs, however, require an understanding of how much eye movement is normal during a typical visual field test. Additionally, tracking may be unreliable in individuals with abnormal pupils, i.e. after previous surgery. Manual monitoring of fixation by the perimetrist. While this is the only way to ensure proper fixation in manual perimeters, it is also an important element in automated perimetry. Many visual field systems allow the perimetrist to observe the eyes of the test taker, allowing for instant feedback and instruction to individuals who do not maintain their gaze on the fixation target. Most perimetric tests require separate testing of right and left eyes. A few tests, however, have been designed to test the binocular visual field. The Esterman test available on the Humphrey Field Analyzer is a suprathreshold test for bilateral visual field loss. Points are not evenly spaced, with more points displayed near the horizontal midline. Methods have also been developed to combine the left and right eye visual field results into a simulated integrated visual field. To date, however, no evidence exists that true binocular visual fields or integrated visual fields are more predictive of important negative outcomes such as falls or motor vehicle accidents. SWAP utilizes the koniocellular pathway and selectively measures the short blue wavelength function by projecting a blue stimulus on a yellow background.16 SWAP has been found to identify early glaucomatous damage in ocular hypertensives, glaucoma suspects, and patients with glaucoma. SWAP may detect visual defects up to five years earlier than SAP in some patients. Despite its improved sensitivity in the assessment of functional deficits in glaucoma, SWAP has several limitations. It demonstrates higher test-retest variability than SAP and is influenced by media opacities. In addition, the prolonged testing time makes it less acceptable by the patients and less efficient in the practice. When interpreting results obtained with SWAP, emphasis should be placed on parameters less affected by generalized reduction, such as glaucoma hemifield test and pattern threshold deviation plot. SWAP is available on HFA II series and Octopus 1-2-3 perimeters. Recently, SITA SWAP has been introduced on 24-2 program and has demonstrated significant reduction in both testing time and variability. FDT is based on the concept that a combination of low spatial frequency and high temporal frequency preferentially targets ganglion cells of the magnocellular pathway.Due to selective uncovering of functional deficits in the My ganglion cells, FDT has been shown to have high sensitivity and specificity for early detection of glaucoma. In addition, given its low test-retest variability compared to SAP, FDT may be advantageous in monitoring progressive loss. Both threshold and screening tests can be performed with FDT, taking approximately five minutes and one minute, respectively. The two threshold layouts are denoted C-20 and N-30 and measure 17 and 19 target locations, respectively. Until recently, a major concern has centered on a large stimulus size used in FDT. FDT can now be performed with a matrix of smaller points, allowing better quantification of defects and increasing its capability to follow progression. Patient's name, date of birth, and age at the time of the test. Refractive error correction used during test. Type of test performed, including the type of stimulus used, the background light level, and the testing strategy employed. Details on the method of fixation monitoring. Information to help judge the reliability of the test, including the rate of fixation losses, false positive errors, false negative errors, and the time necessary for testing. A grey scale plot graphically demonstrates regions to visual field loss by displaying regions with decreased sensitivity in darker tones. Areas of abnormally high sensitivity are shown as white. Pattern deviation plot. This plot is similar to total deviation plot except that it is adjusted for any generalized depression, such as that caused by a cataract or miosis. Each test location is graded as normal, or abnormal at a defined level (p value) compared to a normative population. The lower the p value, the greater its clinical significance and the lesser likelihood of the defect having occurred “by chance”. Pattern deviation plot should be carefuly inspected for early detection or progression of glaucomatous visual filed loss. Results of the glaucoma hemifield test (see section 4.3). Visual field index (VFI). 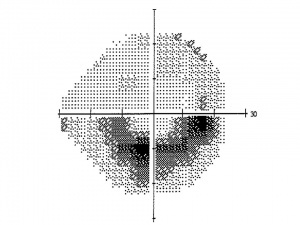 This index expresses the visual field status as a percent of a normal age-adjusted visual field. Greater weight is given to points closer to fixation to adjust for gangion cell density and visual function. The index may also be less sensitive to cataract and media changes. Mean deviation (see section 4.3). The overall mean deviation is categorized as normal, or abnormal at a p-value of 5, 2, 1, or 0.5%, which lower p values corresponding with greater clinical significance and a lower likelihood that the result occurred by chance. Pattern standard deviation (see section 4.3). The overall pattern standard deviation is categorized as normal, or abnormal at a p-value of 5, 2, 1, or 0.5%, which lower p values corresponding with greater clinical significance and a lower likelihood that the result occurred by chance. Fixation losses. Fixation losses, identified as a result of positive responses to stimuli presented in the blind spot, suggest an unsteadiness of gaze which cloud the interpretation of the visual field test. False positives. False positives occur when patient responses are noted in the absence of a presented stimulus. Patients with high false positive rates may show pale areas on the grey scale display, and abnormally high sensitivity on the glaucoma hemifield test. False negatives.False negatives are identified when, upon retesting a previously tested location with a stimulus brighter than the measured threshold value, no response is detected. False negatives may be normal in eyes with advanced visual field loss, but typically reflect poor attention in eyes with little or no visual field damage. High rates of fixation losses, false positive, or false negatives cloud the interpretation of visual field results in 2 ways. First, visual fields were not included into the normative database if rates of fixation losses, false positives or false negatives exceeded 33%. Thus, clinical trials such as the Ocular Hypertension Treatment Study excluded these fields as unreliable, as statistical comparisons to normal may not be valid. Second, visual fields with high rates of fixation losses, false positives or false negatives may indicate poor cooperation with testing procedures, which could yield inaccurate results. The average of these deviations across all test locations is referred to as the Mean Deviation (MD). Subjects, who are able to see dimmer stimuli than others of similar age and race will have positive values for their MD, while subjects who require brighter stimuli will have negative MD values. MD values for reliable tests typically range from +2 dB to -30 dB. Visual field loss in glaucoma is frequently non-uniform, and thus a measure which quantifies irregularities is desirable. Pattern standard deviation (PSD) measures irregularity by summing the absolute value of the difference between the threshold value for each point and the average visual field sensitivity at each point (equal to the normal value for each point + the MD). Visual fields with the age-normal sensitivity at each point will have a PSD of 0, as will visual fields in which each point is uniformly depressed from the age-normal value. Thus, the largest PSD will be registered for focal, deep visual field defects. Near-normal and severely damaged visual fields will both have low PSD. Outside normal limits. The GHT is described as “outside normal limits” when differences between a matched pair of corresponding zones exceeds the difference found in 99% of the normal population, or when both members of a pair of zones are more abnormal than 99.5% of the individuals with the normative population. General reduction of sensitivity. VFs are described to have generalized reduction of sensitivity when both conditions for “outside normal limits” are not met, and the best region of the VF is depressed to a level at the 99.5th percentile within individuals of the normative database. Abnormally high sensitivity. The GHT is described as having abnormally high sensitivity when the overall sensitivity in the affected region of the VF is better than 99.5% of individuals within the normative population. Within normal limits. VFs are described as being within normal limits when none of the above conditions are met. Incorrect patient age. As threshold values are compared to age-adjusted normal values, incorrect age entry will lead to comparisons with the wrong set of normal values. Lens rim artifacts. Thick rims for correcting refractive error, or inappropriate head positioning which causes the lens rim to block peripheral stimuli can cause artifactual depression of the peripheral points. Points are typically severely affected (often with threshold sensitivities of 0 dB), and often show an abrupt drop-off from directly adjacent points. Cloverleaf fields. This pattern of visual field defects reflects poor visual attention and/or malingering. Field results typically show high rates of false negative responses. Miotic pupils or Cataracts. Ocular features which allow less light to reach the retina can cause diffuse depression of the visual field, along with statistically significant decreases in mean deviation. A small pupil may simulate a glaucomatous visual field defect by generalized depression because of miosis or exacerbate an already constricted field, giving a false impression of progression of glaucoma. In cases with concomitant cataract, attention should be paid to the pattern deviation plot as it adjusts for generalized depression caused by the cataract. AAO, Basic and Clinical Science Course. Section 10: Glaucoma, 2015-2016. American Academy of Ophthalmology. Glaucoma: Standard automated static perimetry Practicing Ophthalmologists Learning System, 2017 - 2019 San Francisco: American Academy of Ophthalmology, 2017. Jampel HD, Singh K, Lin SC, Chen TC, Francis BA, Hodapp E, Samples JR, Smith SD. Assessment of visual function in glaucoma: a report by the American Academy of Ophthalmology. Ophthalmology. 2011;118:986-1002. ↑ Anderson DR, Patella VM. Automated Static Perimetry. 2nd edition, St Louis, Mosby, 1998. ↑ Hart WM Jr, Burde RM. Three-dimensional topography of the central visual field. Sparing of foveal sensitivity in macular disease. Ophthalmol. 1983; 90(8):1028-38. ↑ Armaly MF. The size and location of the normal blind spot. Arch Ophthalmol. 1969; 81(2):192-201. ↑ Kerrigan-Baumrind LA, Quigley HA, Pease ME, et.al. Number of ganglion cells in glaucoma eyes compared with threshold visual field tests in the same persons. Invest Ophthalmol Vis Sci. 2000;41(3):741-8. ↑ LeBlanc EP, Becker B. Peripheral nasal field defects. Am J Ophthalmol 1971;72:415. ↑ Werner EB, Beraskow J. Peripheral nasal field defects in glaucoma. Ophthalmology 1979;86:1875. ↑ Ballon BJ, Echelman DA, Shields MB, et. al. Peripheral visual field testing in glaucoma by automated kinetic perimetry with the Humphrey Field Analyzer. Arch Ophthalmol. 1992;110(12):1730-2. ↑ Johnson CA, Keltner JL. Optimal rates of movement for kinetic perimetry. Arch Ophthalmol. 1987;105(1):73-5. ↑ Allingham RR, Freedman S, Damji K, Shafranov G. Shield's textbook of Glaucoma, 5th edition. Lippincott Williams &amp;amp;amp;amp; Wilkins, 2004. ↑ Greve E: Single and multiple stimulus static perimetry in glaucoma: the two phases of perimetry. Doc Ophthalmol 1973;36:1-35. ↑ Johnson C, Keltner J, Balestrery F. Effects of target size and eccentricity on visual detection and resolution. Vision Res.fckLR1978;18:1217-1222. ↑ Bengtsson B, Olsson J, Heijl A, Rootzén H. A new generation of algorithms for computerized threshold perimetry, SITA. Acta Ophthalmol Scand. 1997;75(4):368-75. ↑ Bengtsson B, Heijl A, Olsson J. Evaluation of a new threshold visual field strategy, SITA, in normal subjects. Swedish Interactive Thresholding Algorithm. Acta Ophthalmol Scand. 1998;76(2):165-9. ↑ Shirato S, Inoue R, Fukushima K, Suzuki Y. Clinical evaluation of SITA: a new family of perimetric testing strategies. Graefes Arch Clin Exp Ophthalmol. 1999;237(1):29-34. ↑ Sharma AK, Goldberg I, Graham SL, Mohsin M. Comparison of the Humphrey swedish interactive thresholding algorithm (SITA) and full threshold strategies. J Glaucoma 2000;9(1):20-7. ↑ Sekhar GC, Naduvilath TJ, Lakkai M, et, al. Sensitivity of Swedish interactive threshold algorithm compared with standard full threshold algorithm in Humphrey visual field testing. Ophthalmology 2000;107(7):1303-8. ↑ Esterman B. Functional scoring of the binocular field. Ophthalmology 1982;89(11):1226-34. ↑ Ramulu P. Glaucoma and disability: which tasks are affected, and at what stage of disease? Curr Opin Ophthalmol. 2009;20(2):92-8. ↑ Quigley HA, Dunkelberger, Green WR. Chronic human glaucoma causing selectively greater loss of large optic nerve fibers. Ophthalmology 1988;95:357-363. ↑ 21.0 21.1 Johnson CA, Adams AJ, Casson EJ, et al. Progression of early glaucomatous visual field loss for blue-on-yellow and standard white-on-white automated perimetry. Arch Ophthalmol 1993;111:651-656. ↑ Johnson CA, Samuels SJ. Screening for glaucomatous visual field loss with frequency- doubling perimetry. Invest Ophthalmol Vis Sci 1997; 38:413-425. ↑ Demirel S, Johnson CA. Incidence and prevalence of short wavelength automated perimetry deficits in ocular hypertensive patients. Am J Ophthalmol 2001;131:709-715. ↑ 24.0 24.1 Anderson AJ, Johnson CA. Frequency-doubling technology perimetry. Ophthalmol Clin N Am 2003;16:213-225. ↑ Cioffi GA, Mansberger S, Spry P, et al. Frequency doubling perimetry and the detection of eye disease in the community. Tr. Am. Ophth. Soc. 2000;98:195-202. ↑ Spry PGD, Johnson CA, McKendrick AM, et al. Variability components of standard automated perimetry and frequency doubling technology perimetry. Invest Ophthalmol Vis Sci 2001;42:1404-1410. ↑ Keltner JL, Johnson CA, Cello KE, et. al. Visual field quality control in the Ocular Hypertension Treatment Study (OHTS). fckLRJ Glaucoma. 2007 Dec;16(8):665-9. ↑ Bosworth CF, Sample PA, Johnson CA, Weinreb RN. Current practice with standard automated perimetry. Semin Ophthalmol. 2000;15(4):172-81. This page was last modified on October 20, 2017, at 11:30. This page has been accessed 438,440 times.